New York composer Steve Reich's first piece, It's Gonna Rain, consisted entirely of manipulating tape loops of a San Francisco street preacher's raving sermonette. His first composition performed live was Piano Phase, in which two pianists repeating the same simple melodic pattern gradually go out of and then back into phase with one another. Reich’s latest major work, Variations for Winds, Strings, and Keyboards, received its premiere last May in the full orchestral version performed by the San Francisco Symphony under Edo de Waart's direction. From phasing to full orchestration, from two musicians to 75, Reich has gotten maximum mileage out of what has often been called "minimalist" music. "Starting from an extremely radical point with Piano Phase," says the 44-year-old composer, "I've gradually been adding more instruments, increasing my harmonic vocabulary, and increasing the timbral variety in order to enrich the music. I've begun to see that changes I've made over the years which I consider progress other people could view as a step backwards into traditional Western thinking. But -- there's this one big 'but' -- it’s not a replay of Stravinsky or Bartok in any way. The basic vocabulary is mine." Reich's "basic vocabulary" of dominant rhythms, repetition, static forms, slow changes and audible processes is not his alone, though. It's shared by all the composers of what's been labeled "trance music," a style which Reich and Philip Glass in particular have, over the last several years, made not only famous but popular. When I first heard this music, I could only approach it aesthetically. I couldn't understand it as music, I didn't "get" it. Then I performed in a dance concert that used some of Glass's music from Einstein on the Beach; the dancing consisted mostly of walking in patterns cued to practically inaudible changes in the piping, hypnotic music. But then one day walking down the street, my steps connected with those of the dance, and the repetition in Glass's music instantly made sense as a stylization of the repetition of familiar sounds in everyday life. Another time, I spent a rainy afternoon lying on the floor, listening to Reich’s Drumming. Eventually, I realized that Drumming had stopped, but the drumming hadn't: the rain beating down on the air conditioner outside my window produced steady rhythms and intricate melodies similar to those Reich had composed. Banal examples, maybe, but they struck me as epiphanies. Far from being dry formulations that can only thrive in the lifeless lab of academe, this may be the most natural music in the world. Its unmistakable parallels to various forms of jazz, progressive rock and disco, and its influence on such rock stars as David Bowie and Brian Eno, give this music an accessibility that has garnered Reich and Glass SRO crowds at venues as diverse as the Bottom Line and Carnegie Hall, as well as record releases on prestigious rock/jazz labels such as ECM and Tomato. Moreover, their names have become buzz words used by people who haven't even heard their music to describe a certain kind of sound. It’s useful (if not exactly accurate) to relate the steady pummeling of Reich’s Music for 18 Musicians or the pulse of Glass's organ music to German synthesizer bands like Tangerine Dream or to robot-rocker Gary Numan or to Eurodisco maestro Giorgio Moroder, if only to indicate how the same sounds -- in whatever organic or synthesized forms -- appear in both our classical and ethnic and popular musics. But as soon as you acknowledge that, you have to start drawing lines again, and the distinction between Steve Reich and Philip Glass needs to be made. There is plenty of good reason to speak of them in the same breath. Both men are in their early forties, went to the Juilliard School of Music at the same time, and studied with some of the same teachers (Vincent Persichetti, Darius Milhaud). Both composers characteristically reject the conventional, storytelling (theme and counterpoint, tension and release) classical style in favor of a dense, level, repetitive, slow-moving, often systematically composed music. This is largely because both men, like nearly all important contemporary composers, have been profoundly influenced by non-Western music. And in the late 1960s, the careers of Reich and Glass were literally intertwined to the point of sharing musicians and playing on each other's work. One recording of Reich’s seminal Four Organs featured Glass as player, and one early Glass solo was called Two Pages for Steve Reich (now known as simply Two Pages, undoubtedly in an attempt to downplay the relationship between the two). Reich, on the other hand, favors acoustic instruments, especially percussion and mallet instruments (marimba, glockenspiel, xylophone, metallophone), so his music tends to be delicately textured where Glass's is dense. Reich’s lineup of musicians and instruments has ranged wildly as indicated by the titles of his works -- Four Organs, Six Pianos, Music for 18 Musicians (and a partridge in a pear tree!). His development as a composer has followed a fairly simple, linear progression from tightly constructed minimalist experiments to gradually more complex and lush orchestration. Not surprisingly, his non-Western influences are more spread out. A relative latecomer to music, Reich initially studied philosophy at Cornell, though he'd been listening to jazz and playing drums when he was 14 and took a music history course at Cornell, in which he first encountered Balinese gamelan music. It wasn't until after he'd gotten out of college that he cast his fate with music and began studying composition privately with Hall Overton and later at Juilliard and at Mills College in California, where he acquired an intense interest in African music. 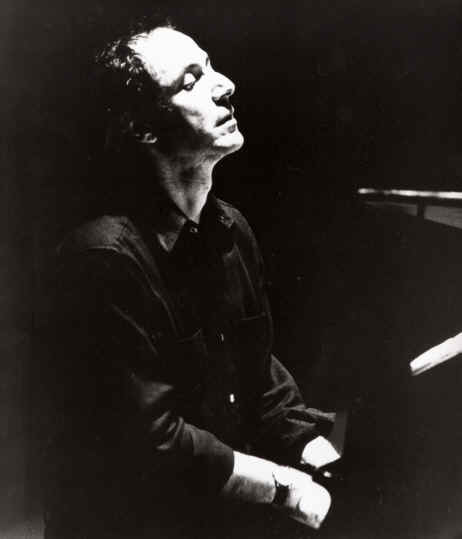 "When I was studying with Luciano Berio at Mills in 1962," says Reich, "there was a summer conference at which Gunther Schuller gave this lecture on early jazz and talked about a book of scores he'd found called Studies in African Music by A.M. Jones. I went back to Berkeley and got the book out of the library; it was in two volumes, one of scores and one of analysis. I was knocked out, because this book showed what was going on in the music -- this full-blown polyrhythmic construction of short motives playing against each other, mostly in subdivisions of what we would call 12/8 -- that hearing the music didn't do. Seeing the music in notation, as a composer, was like opening a door." Reich returned to New York in 1966 to pursue his own music, but he did take a couple of lessons with an African master drummer who was teaching at Columbia University, and in 1970 he received a travel grant to study drumming with a master drummer of the Ewe tribe in Ghana. "I studied African music because I wanted to go to a culture where drums, instead of being associated with nightclubs and low-grade music we're ashamed to talk about, represented the high point of cultural achievement," he says. "It represented the classical music, the religious music, and the get-drunk-and-have-a-good- time music. There's a healthy continuum to the music within the culture. "But," says Reich, "it wasn't like I went to Africa to do something I hadn't done before. Africa confirmed my intuition that acoustic instruments could be used to produce music that was genuinely richer in sound than that produced by electronic instruments, as well as confirming my natural inclinations towards percussion.” Reich's monumental 90-minute Drumming, composed in 1971 (for eight tuned drums, three marimbas, three glockenspiels, male and female voices, whistling and piccolo), seems most obviously to reflect what Reich learned to had confirmed in Africa., but it was just as much an extension of his earlier "process" pieces. "I am interested in perceptible processes," Reich wrote in a 1968 essay called "Music as a Gradual Process." "I want to be able to hear the process happening throughout the sounding music...The use of hidden structural devices in music never appealed to me. Even when all the cards are on the table and everyone hears what is gradually happening, there are still enough mysteries to satisfy all." Almost as soon as he wrote that, though, it was no longer true. After Drumming, Reich abandoned his strictly process oriented music and began combining processes and mixing timbres in Music for Mallet Instruments, Voices, and Organ. Although still closely identified with the notion of "systems" music, he has gone on to incorporate more harmony and more instruments with every piece, from the bowed basses and sunburst brass (scored in durations based on human breaths, an idea Reich got from practicing hatha yoga) in 1978's Music for Large Ensemble to the dry staccato violins of Octet to the circusy organs and flutes in Variations for Winds, Strings, and Keyboards. Reich isn't 100% happy with this direction. Although he admits that the minimalism of his earliest work was primarily dictated by his severe limitations as a performer, he doesn't necessarily consider his expansion progress. "When you move from two instruments playing absolutely lucidly and transparently to a much richer, conventionally more acceptable and more popular music, you gain in complexity but you lose in focus and elegance." On the other hand, it's quite interesting to view Reich’s progression from one piece to the next as that of a composer endeavoring to explain to himself the very essence of music. What is rhythm? What is melody? What is harmony? Stripping music down to its basic e1ements and then rebuilding it piece by piece, Reich's work asks age-old questions and answers them in surprising new ways.